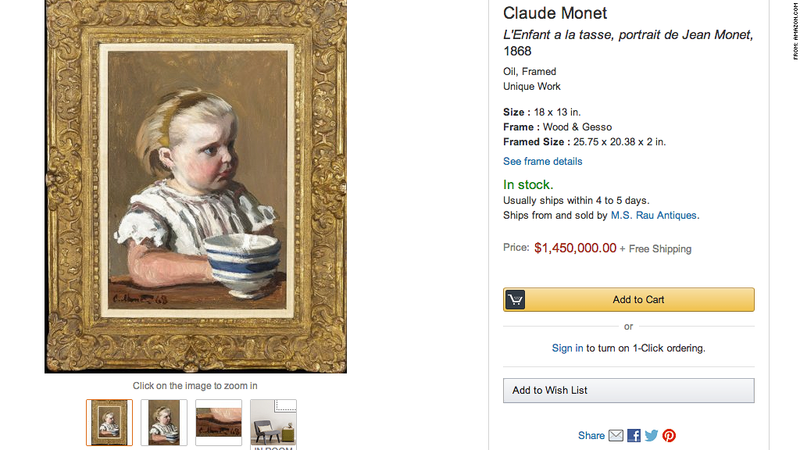 Buy your next Monet from the comfort of your own mansion. Will people who buy books, electronics and movies online also like to buy million-dollar works of art that way? The online retailer on Tuesday announced the launch of Amazon Art, on which it offers more than 40,000 works of fine art from over 150 galleries and dealers. Artists whose works are being offered include Claude Monet's Fragment de Nymphéas and L'Enfant a la tasse, portrait de Jean Monet; Andy Warhol's Hamburger Michel and Norman Rockwell's Willie Gillis: Package from Home. Those pieces are each listed for more than $1 million, with Rockwell's work listed at $4.85 million. But the site also has numerous pieces, including prints, photographs and some unique works, listed for under $200, with some as low as $25. Among the galleries offering works through the site are Paddle8 in New York, Holden Luntz in Miami, McLoughlin Gallery in San Francisco, Modernbook in San Francisco and Catherine Person Gallery in Seattle.